Nine thousand miles away I woke up in Bangaluru, India to birds chirping outside the window. The sun's edge cutting through the shades warming my feet as I cut across the hotel room barefoot. I was excited to get outside and begin our second day in the capital of Karnataka. However, the day would begin in the most western of ways, at a white cloth table, rooftop, poolside with a breakfast of massive proportions. Our hotel had prepared nearly thirty different dishes of various Indian, Middle-Eastern, and Western recipes. Our vegetarian-only hotel provided all this for free, under the relaxing morning sun of a bustling city. We could have never afforded such luxuries in America, but in India the cost of living well is affordable by American standards. It's paradoxical to our sense of relativity knowing that our our status of being poor, recently graduated college students in the U.S., afforded us relatively upper class living here in India. For both of us, it was difficult to transition from coupon cutting and budgets to a world where we were served by numerous staff, had a driver (in the days to come), and anything we ever wanted was just a call away. At one point, I attempted to make my own cappuccino, and the staff looked at me like they had just witnessed something incredible (maybe offensive). I didn't realize that it was their job to make it for me and it took a bit of discomfort on my part to let go, and allow myself to be served by others. Shannon felt extremely uncomfortable and likened the experience to a antiquated colonial experience, heavily warned about in academic readings in her degree in anthropology. It's hard to put in perspective as such practices due occur in America, but generally only for the moderately wealthy, which we are not (in the U.S.). To be frank, we were both unaccustomed to the situation we found ourselves in and the experience made us question ourselves with no clear direct understanding or self-comfort. Soon we were at ground level and feeling a bit more like ourselves, flagging down a rickshaw a few blocks from the hotel. These open, three wheeled mopeds fill the streets and weave in and out of traffic with a chaotic order absent of actual perceived rules. For those who suffer from any sort of fear of aggressive driving, this may not be the place for you. I was smiling and laughing as we dodged dogs, cows and large trucks. "We've got cows", I remarked referencing the 1996 movie Twister. Shannon just smiled, gripping the cross bar of the auto. While she stomached the weaving and braking with a brave face, occasionally she'd glare over at me as we stopped just inches from the door of a large bus or a child. Her gladiator persona doesn't have the disregard for personal safety that I have. She's the rational, pragmatic side of us, while I'm the delirious, giddy, slightly crazy one, who is screaming inside, "go faster!". Our first stop was Bull Temple, a Hindu temple devoted to Nandi, a demi-god of Shiva that houses a large stone idol carved from a 15 foot tall, single piece of stone that resembles a bull. The architecture is amazing both inside and out and the temple has been erected over the centuries from more modest iterations to become what it is today. 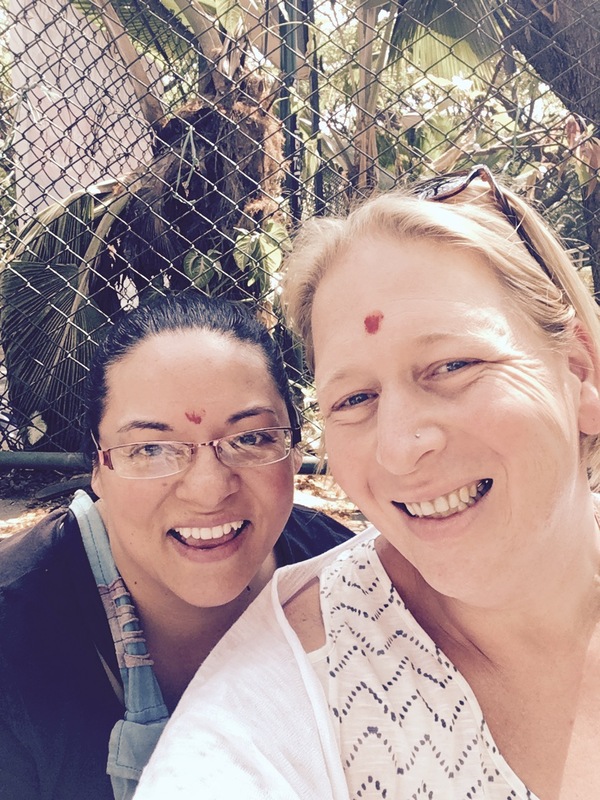 Here is where we received our first bindi (red dot on the forehead), a sacred symbol that provides protection to the wearer and represents a meditative center of the un-manifested state. Feeling enlightened, we headed off to Brahmins' Coffee Bar just a few blocks away. It's a famous landmark in Bangalore owned by Radhakrishna Adiga. Brahmin which translates to "supreme self" (first of God) is the highest caste (societal group) of which Hindu priests are drawn and are mandated to learn and teach the virtues of their beliefs. Virtuous restrictions are placed on Brahmins that number almost 60 million individuals in India. As we would find out, they also make amazing vadas (Indian doughnuts) and idlis (savory cakes). Though it's a poor comparison, it could be said Brahmins' serves up India's version of biscuits and gravy. Brahmins' Coffee Bar is a bustling open front cafe with no seats and a queue that reaches out into the street. You eat from metal canisters on the sidewalk where you can meet almost anyone and everyone under the shared experience of Bangalore's comfort food. It's exactly what travel should be, nothing fancy, hidden on a backstreet, and perfectly delicious. It's the one place every tourist should make a b-line to, after landing from the airport. It's unforgettable street foods that goes down as legendary global cuisine. A word of warning, you will crave Brahmins' for as long as you live. Such is the curse of living a world away. As the heat of the day approached we returned to the hotel via auto, discovering that we had became better at the process of navigating the city. Despite the size and population of Bangalore, it's amazing how quaint and navigable the place becomes. The city becomes more and more comfortable by the minute. A year and half earlier I was living in Cardiff, U.K. doing my master's degree. My roommates for the year happened to be mostly Indian and some of the closest relationships I formed were individuals from India. They dispelled many misconceptions, taught me new words, introduced me to Bollywood and became my family. When I was offered a job in Chennai, I had the opportunity to take the plunge and move here but decided to to turn it down to follow the U.S. embassy scheme here in the States. A decision that turned out to be a mistake after the U.S. election, and which would change the political climate in America. Now, as my dirty feet in my worn out sandals carried me down the streets of Bangalore's crooked sidewalks, I felt a sense of regret. As a six foot tall white woman with short hair, I should feel completely out of place in India, but somehow that wasn't the case. Everyone was warm and welcoming. A sense of belonging was shadowing both of us and Shannon seemed completely at home hitting every juice shop she could find. Even the hotel security took note of the fact we weren't leaving by taxi like the other business people at our stay. We were gaining a reputation among the staff, maybe even earning their respect as we arrived, bindis and all, back into the lavish lobby of the Melange Astris by rickshaw. The "stupid white tourists" label, with which we commonly bestow upon ourselves as supposed ethnocentric aware travelers, seemed to invoke respectful humility as we shed their expectations. The hotel staff smiled, a rare find among a very serious staff that probably sees their share of westerners who commit themselves to the sanctuary of a hotel room, held up inside, with bottles of bourbon, empty of exploration or adventure. Sure you can say you've been to Bangalore, but did you breath it, feel it, or become a part of it from the window of your car and hotel room? To quote author, Helen Hanff in London, "kiss it for me". Likewise, if you're ever in Bangalore, do yourself a favor and get that close. Embrace it. After an invigorating swim in blood curdling cold water in the infinity pool and laying out poolside in the warm winds of India, we met up with Aditi. Aditi, who was one of my closest friends from my time at university was one of the primary reasons I wanted to come to Bangalore. She was unable to come to our graduation back in July and her absence in my life had left a hole in my heart. She had planned an evening at Ente Keralam, a restaurant on the north side of city center set in palm and coconut trees serving authentic foods from Kerala (a coastal state in southern India). The food was absolute perfection with notes of sweet coconut and spice. Served in a delightful, quiet refuge, so hidden from the bustle of the main roads that you feel you're dining in someone's home. The restaurant claims their recipes are from a "bygone era" and their attempt to revive specialty foods from Kerala is an experience that I will never forget. Aditi was the first to explain to me that eating with your fingers, rather than cutlery is a preferred experience. It's the idea that food should encompass all your senses: taste, smell and feel. Indeed, sitting at a high-end restaurant, pinching food between bread sans silverware is something you must partake in India. It's these nuances of tradition and culture weaved in between traditional flavors that I had never tasted which made me fall in love with Bangalore, more and more. As we left the restaurant, I realized our day was coming to an end. We had seen and done so much, but it would never be enough. I didn't want to go back to the hotel, I wanted to roam the city, absorb every last second I had here. A week ago, I was lamenting over finding a job, doing chores and trying to figure out my life... but tonight, none of that mattered because this was my life. As we arrived at the hotel, fireworks shot out over top the building. Ugadi (lunar New Year) had began. We stood on the roof as the sky boomed with explosions and colors filled the night's sky. It ended the most perfect day in the most wonderful country of the world: India. A place that you can't help fall in love with, and if you're ever there, kiss it for me. Continue reading part III: Balance in India: What begins must end. - Cubbon Park, Commercial Street. Honestly, I went out for Indian food yesterday after an intense craving for some cheese naan and discovered something amazing. First thing is first, Café Mirchi (formerly Indian Palace) has a superb menu of traditional Indian and Pakistani cuisine. You can order it white person tasteless to Indian hot and the portions are generous. I loved the Chicken Karahi. Even better yet, they're on Restaurant.com for a $15 for $6 gift certificate, and if you sign up with their newsletter, they'll send you a 10% off coupon in your email, immediately. But seriously, the best reason to go to Café Mirchi, besides their super cool Tate Street location? Chocolate naan bread. That's right! Traditional flat bread covered in butter, drizzled in Nutella with a scoop of ice-cream. Think of it as a fat crepe. It's out of this world.